Dams and barriers are often considered positive landscape features because they can generate power, provide recreational opportunities, block invasive species, and prevent contaminant and disease transfer upstream in an aquatic system. The flip side of that coin is that barriers can also reduce ecosystem function by reducing species richness, fragmenting habitats, impairing animal movements, impounding water, increasing temperature, and altering sediment transport. Many native species require connectivity between lakes and tributary habitat to complete their lifecycle. Addressing the tension between improving aquatic connectivity for fishery restoration versus using dams and barriers for invasive species management is one of the biggest issues facing the Great Lakes. Besides labor intensive trap-and-sort operations where desirable fishes are manually separated from non-desirable fishes, a solution to remove invasive fishes and provide upstream access for desirable fishes remains elusive. A major question is can we connect lakes and tributaries to benefit desired species in a way that prevents unacceptable risks from detrimental species, such as the sea lamprey, which can kill up to 40lbs of fish? FishPass is being designed to address this question. 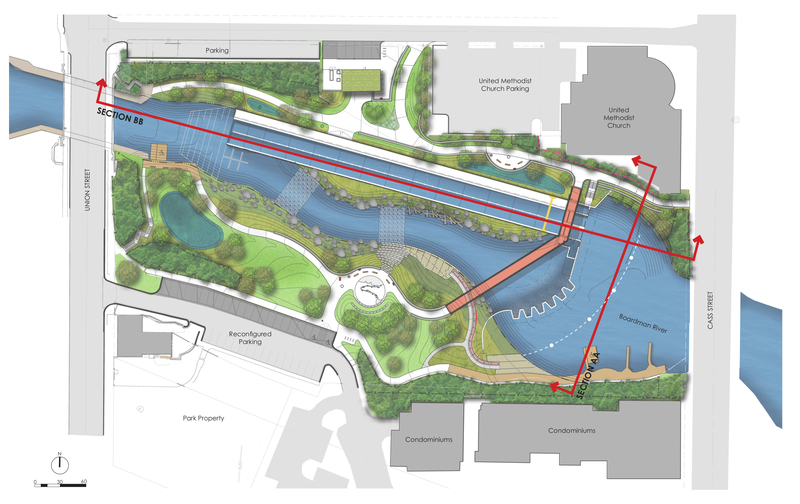 FishPass will be the capstone of a ~20y restoration project on the Boardman (Ottaway) River, Traverse City, Michigan, re-connecting the Boardman River with Lake Michigan. The mission of FishPass is to provide up- and down-stream passage of desirable fishes while simultaneously blocking and /or removing undesirable fishes. FishPass will replace the deteriorating Union Street Dam in downtown Traverse City, Michigan with an improved barrier featuring a fish-sorting channel and a nature-like river channel. Once constructed, scientists will optimize various sorting technologies and techniques below the barrier to maximize efficiency of passing desirable fishes and removing invasive fishes. For example, water velocity barriers, light guidance, video shape recognition, and eel ladder style traps are just some technologies that could be integrated at the facility to sort fish and effectively pass or remove animals. The result will be a world-class technology and research center in a park-like setting. FishPass is prominently located in downtown Traverse City and, therefore, available to its many residents and visitors. The community has placed high value on natural resources and the health of the Boardman River and has a strong desire to integrate the river into the fabric of the city. FishPass provides an excellent opportunity to support these community values through design and development of strong education and outreach components. Once optimized for bi-directional (up and downstream) selective fish passage, FishPass will be converted to a permanent selective fishway completing the Boardman River Restoration Project. Lessons learned from the optimization phase will be applied to similar rivers to create selective fish passage at new sites. The project could have regional, national, and global implications. 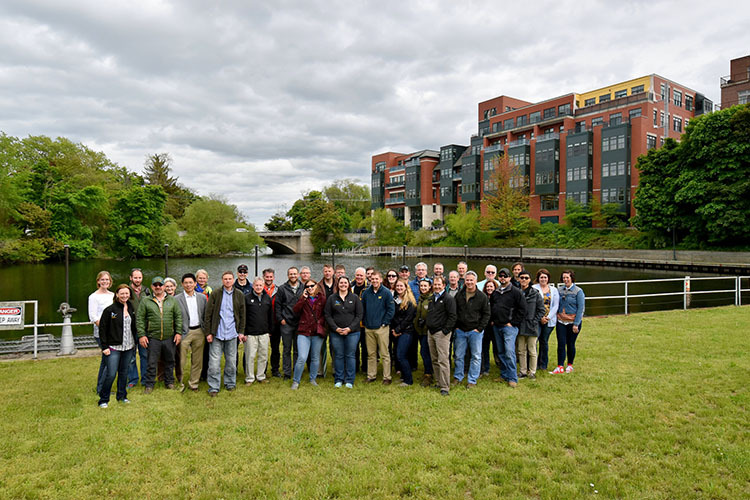 A team of about 50 fish passage experts, fish behavior and ecology experts, engineers, and hydrologists participated in three workshops during 2016-18 to identify site-specific needs and design elements to allow for bi-directional selective passage on the basis of the ecology of target species. The workshops also facilitated evaluation of four alternative concept designs to identify a solution that is maximally flexible to accommodate various fish sorting technologies and techniques. The 30% engineering design was completed in February 2018 and a Value Engineering Study was completed in May 2018 to identify cost saving design alternatives. The 65% design was completed in November 2018 and is currently under regulatory review and open to public comment (see announcement below). In the spirit of transparency, the FishPass team will make project documentation publically available. The documents below were generated by teams of scientists, engineers, and project managers, with input from local stakeholders taken into account. As FishPass evolves so too will the project documents; therefore, documents are considered live and will be periodically updated. For this reason, be sure to check the file date to ensure you have the most up to date version. Community and stakeholder input has been essential to the evolution of the conceptual model, integrating FishPass into the City Master Plan, and working with the City Commissions and Staff about use and design of the space supporting the project. Feedback from all community engagement activities have been actively incorporated into design elements of FishPass and current monitoring efforts. February 12, 2019 - The FishPass team will host an informational open house at the Traverse City Government Center between 4-6 PM to provide an update on planning, design, and permitting of FishPass. The public will have an opportunity to talk ono-on-one with representatives from the following project partners: Great Lakes Fishery Commission, MI Department of Natural Resources, City of Traverse City, Grand Traverse Band of Ottawa and Chippewa Indians, US Army Corps of Engineers, and engineer of record, AECOM. The open house will be followed immediately by a public comment session hosted by the Michigan Department of Environmental Quality (MDEQ) concerning the Joint Permit Application. May 30-31, 2018 - The FishPass team engaged the Traverse City and surrounding area angling community in a two-night workshop to identify and begin to address angler concerns and issues regarding Boardman River fisheries as they relate to FishPass design and ongoing monitoring and assessment. The first night, which was open to the public, generated via a panel of angler group representatives, an exhaustive list of angler concerns and issues. The items were synthesized and organized into ten categories by the FishPass team and discussed with angler organizations’ leadership (i.e., Focus Group) on the second night of the workshop. View the workshop proceedings. All discussion from the open forum and the focus group was documented and the FishPass team provided responses to issues, and identified action items related to each issue. Angler Panel Consisted of the following members: Mike Coonan and Ted Wendling (Brook Trout Coalition), Michael Sipkoski and Chad Brown (Trout Unlimited – Adams Chapter), Bryan Burroughs (Trout Unlimited – Michigan Chapter), Dennis Eade (Traverse City Steelheaders chapter of Michigan Steelhead and Salmon Fisherman’s Association), and Ryan Matuzak and Wes Newberry (Grand Traverse Area Sport Fishing Association). October 10, 2017 - The FishPass team assisted the City of Traverse City in hosting an open house to seek public input on the design of FishPass. Public consultations led by Michigan Department of Natural Resources and Grand Traverse Band of Ottawa and Chippewa Indians will identify "desirable" species thereby prioritizing needs for passage. 03 Jan. FishPass team members provided an update to the Traverse City Parks and Recreation Board. The Board unanimously passed a motion to support the FishPass design. 07 Jan. FishPass team members provided an update to the Traverse City Commission. 19 Jan. Mark Breederland (MI Sea Grant) presented a FishPass update at the Ludington Regional Sportfishery Workshop. FishPass team members met with AECOM to begin development of a plan for education, information, and wayfinding signage at FishPass. AECOM has begun responding to comments from the 65% design and initiated work for the 90% design submittal. AECOM and FishPass team members began coordinating with engineers at the University of Minnesota’s Saint Anthony Falls Laboratory to design an automated data carriage for FishPass. The 90% design submittal is expected to be complete by the end of March 2019. 01 Feb. the Science Team of the FishPass Advisory Board will meet to discuss the formation and implementation of an annual plan of research at FishPass. 08 Feb. the Core Group of the FishPass Advisory Board will meet in Traverse City to discuss project funding, collaborations, and develop an MOU on FishPass operation and maintenance. 12 Feb. the FishPass team will host an informational open house at the Traverse City Government Center between 4-6 PM to provide an update on planning, design, and permitting of FishPass. The public will have an opportunity to talk ono-on-one with representatives from the following project partners: Great Lakes Fishery Commission, MI Department of Natural Resources, City of Traverse City, Grand Traverse Band of Ottawa and Chippewa Indians, US Army Corps of Engineers, and engineer of record, AECOM. The open house will be followed immediately by a public comment session hosted by the Michigan Department of Environmental Quality concerning the Joint Permit Application. What fish are to be allowed up stream, how is that controlled, and what provisions are in place to change any decisions? The Michigan Dept. of Natural Resources, in consultation with the tribes while incorporating local viewpoints, will determine which species should be allowed to pass through the facility and which species, including sea lamprey, need to be blocked. During the optimization phase of FishPass, no unintended fish species will be introduced to the river or passed above the Union Street Dam. The objective for long-term operation is to have a self-sustaining structure that allows desirable species to pass and prevents undesirable species (including invasive species) from moving above the barrier. Why was the Boardman River selected? The Boardman River ranked first out of a dozen other sites considered for FishPass because the community has been so engaged in the overall restoration of the river, because Union Street Dam is a barrier to fish passage to and from Lake Michigan, and because the Union Street Dam also serves as a much-needed, but in disrepair sea lamprey barrier that protects the Boardman River watershed from infestation. Why experiment with the Boardman River? FishPass does not "experiment" with the river, it experiments with technology. FishPass technologies will be tried and evaluated in contained channels below a complete barrier during the approximately 10-year optimization phase. The labyrinth weir (south bank) will operate as a permanent barrier to all fish while the fish-sorting channel headworks (north bank) will have redundant hydraulic gates that can be adjusted to block all or some fish passage depending on what species are deemed desirable for passage. What if sea lamprey infest the watershed? FishPass will have multiple fail-safes (e.g., high dam and redundant gates) incorporated to protect the Boardman River environment during the optimization phase and after implementation of fish sorting technology. The new structure will greatly reduce the risk of sea lamprey passage compared to the existing structure. If sea lamprey do infest the upper Boardman watershed, it will be treated by the Great Lakes Fishery Commission as is currently done when necessary. The Boardman River has been treated with lampricide seventeen times since 1963. Of those treatments, six have been above the Union Street Dam, with the most recent treatment in 2015. How will you prevent contaminants and diseases from moving up river? Much of the contaminant pollution in the Great Lakes is now due to atmospheric deposition, which affects areas above and below the Union Street Dam. On the basis of current research at Notre Dame University by the Lamberti lab, Pacific Salmon carcasses and eggs do pose a risk of contaminant bio-transfer to fishes residing in streams, but most salmon are currently blocked and removed from the river at the Michigan Department of Natural Resources Trap and Transfer facility, downstream of Union Street Dam. Regardless, many Michigan streams have runs of Pacific Salmon and there have been no detrimental consequences associated with increased contaminant burden documented. Michigan Department of Natural Resources tests fish at the Trap and Transfer facility downstream of Union Street and have seen very low to no occurrences of diseases (e.g., VHS). Will there be any change to operations at the Boardman River Trap & Transfer facility? Michigan Department of Natural Resources does not expect to operate the facility any differently in the future. Chinook and Coho will be harvested to the point of diminishing return and all other species will be passed. If bi-directional selective fish passage is not achieved, we are still better than the status quo, as the deteriorating Union Street Dam will have been replaced with a new more effective barrier. This project is a big challenge, and we may not succeed with bi-directional selective fish passage. But, we must try. How will gobies and other invasive fishes be prevented from entering the Boardman River? The intent of the project is to develop an approach to exclude sea lamprey and selectively pass desirable fishes. Gobies are not a primary target for sorting as they currently occur in Boardman Lake, above Union Street Dam. Should other invasive fishes pose a risk to the river, FishPass can be modified to selectively sort them out as well, but this will require additional study. How will you maintain water levels in Boardman Lake? It will not affect water levels in Boardman Lake. The proposed facility will utilize a passive, overtopping spillway to pass flood flows while maintaining water levels in Boardman Lake. A set of manually operated gates will be used only to divert a portion of available water through fish-sorting channels as needed without lowering the water level in Boardman Lake. What safety measures will you take at the site to prevent people from getting injured or from tampering with experiments? Appropriate signage, protective railings/fences, and lighting will be used to direct the public towards designated observation areas and away from any potentially hazardous conditions. Controls and experimental technology will only be accessible by research, city, and agency staff. Will fishing be permitted at FishPass or will there be new regulations? FishPass will have a nature-like channel located on the south shoreline of the river that will be available for fishing throughout the optimization phase. We anticipate there may be a need to temporarily halt fishing within the project footprint, but these instances would be few and of short duration. Once fully operational, fishing will be allowed per existing regulations. The design phase of the project is currently funded by the Great Lakes Fishery Commission, the Great Lakes Fishery Trust, and the Great Lakes Restoration Initiative. Funding for the construction phase of the project (2019) has not yet been secured. Local funding team has had amazing success funding the project as a whole and efforts will continue. Who will decide what tests are conducted at the site and when? Current plans aim to have research efforts coordinated by an advisory board, a public review committee with representatives from, but not limited to, the Michigan Department of Natural Resources, US Army Corps of Engineers, Great Lakes Fishery Commission, Traverse City, Grand Traverse Band of Ottawa and Chippewa Indians, US Fish and Wildlife Service, and US Geological Survey. Research proposed by independent researchers would be reviewed and selected on an annual basis. Who is going to maintain and operate the site? Michigan Department of Natural Resources, the city, and the Grand Traverse Band of Chippewa and Ottawa Indians via a Memorandum of Understanding or Memorandum of Agreement. Will this project include a whitewater park? 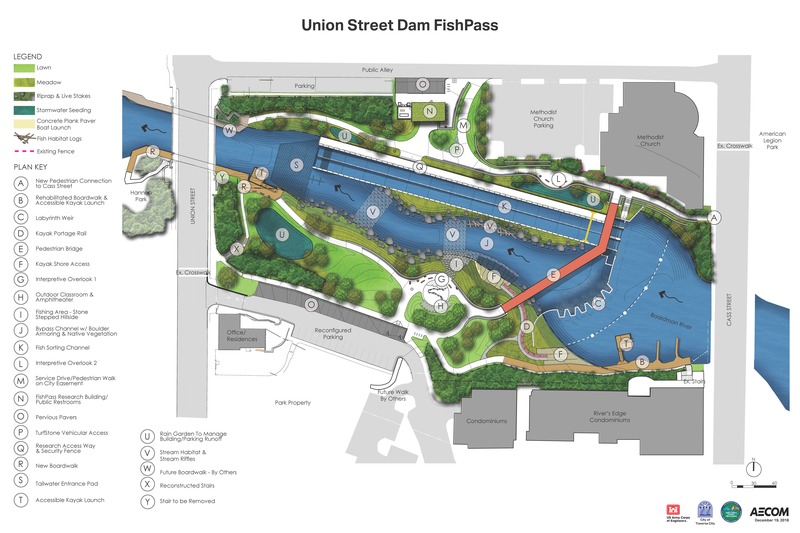 FishPass does not feature a whitewater park, but can improve the recreational use of the Union Street Dam site by improving public access (i.e., kayak and canoe, walking & biking paths), angler access, and education and outreach opportunities. A wide range of river users, residents, and tourists will benefit from FishPass. A whitewater park could not be incorporated into the design because much of the elevation difference between the lake and downstream channel (the source of most whitewater features) is required to maintain a complete barrier to sea lamprey. Why is it necessary to modify and retain a structure at Union Street? The existing structure has allowed invasive, parasitic sea lamprey to pass above the dam on multiple occasions. The Boardman River Implementation Team has also identified structural issues with the Union Street Dam that require substantial repair and they determined it was not feasible to remove the Union Street Dam until a solution for blocking sea lamprey was developed. The Union Street Dam also provides about 6 feet of additional water level height at Boardman Lake. The Boardman River is presently a "Blue Ribbon Trout Stream." How can the Boardman maintain this status with changes to fish passage at Union Street Dam? Exactly how changes to fish passage at Union Street Dam will impact the upstream fishery is uncertain, as the river is undergoing dramatic changes with the removal of three upstream dams. Extensive monitoring and precise releases of fish are needed to be able to quantify and evaluate any environmental or biological responses, and FishPass is uniquely able to accommodate such analysis. To support research on fish passage technologies, FishPass will also incorporate a substantial assessment program that includes fishery and habitat surveys, genetic sampling, eDNA sampling, and fish tracking. In contrast, the existing fishway at the Union Street Dam offers little ability to control fish movement. In fact, the only species thought to be able to pass the existing fishway (albeit in low numbers) are introduced and non-native steelhead, pacific salmon, and brown trout.